the lunch boxes in the 1950's pictures are so cute! 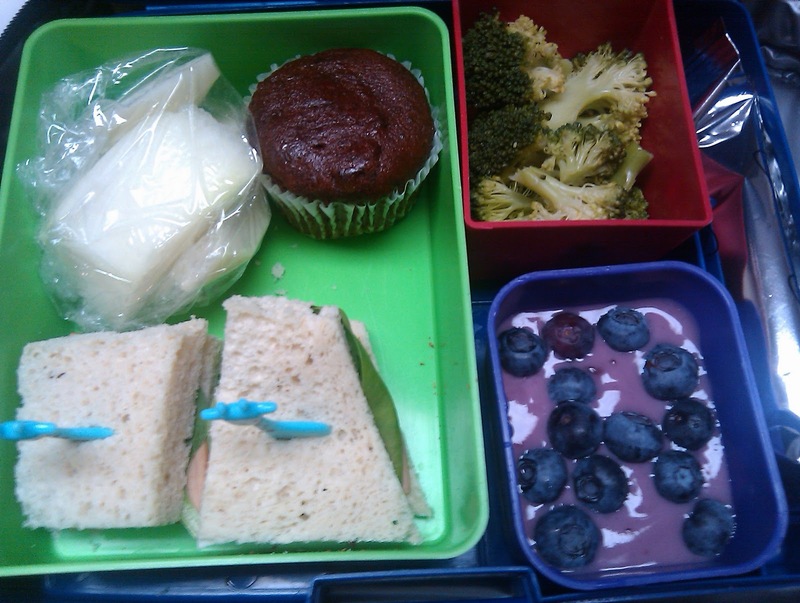 Wow, you're doing a great job with your son's lunches. They all look so yummy and so much healthier. I make my own chicken nuggets/fingers too. But instead of frying, I spray some olive oil on them and bake them at 400 degrees on a lined cookie sheet until they are nicely brown. I flip them half way. They are less greasy and healthier. Plus no oil splatters and cleanup is a breeze, which I love. We use breast meat since hubby only likes white meat, but thigh meat is so much tastier to me! Keep up the great work Mrs. Q! I never tried making my own chicken nuggets because I always thought it was easier store bought. I have to try making it one day when school lets me. Your son is adorable. It's good to that he knows what he can and cannot have. when one is intolerant to gluten and/or casein (the biggest problematic dairy protein), one generally is unable to uptake minerals and vitamins in the gut because the gut lining is constantly inflamed. by eliminating those problematic proteins, you SHOULD notice a change, like improved hair growth, easier teething, etc. because he'll be better able to uptake the important nutrients. in addition, YOU should start to see (if you haven't already) a reduction in inflammation – perhaps no more creaky joints? oh, a recent genetic study suggests that there is a shared genetic history for Crohn's disease and Celiac disease. i wouldn't be surprised if we find out that all IBS, IBD, and similar conditions are derived from a combination of nutrition + genetics with an overlay of epigenetics. 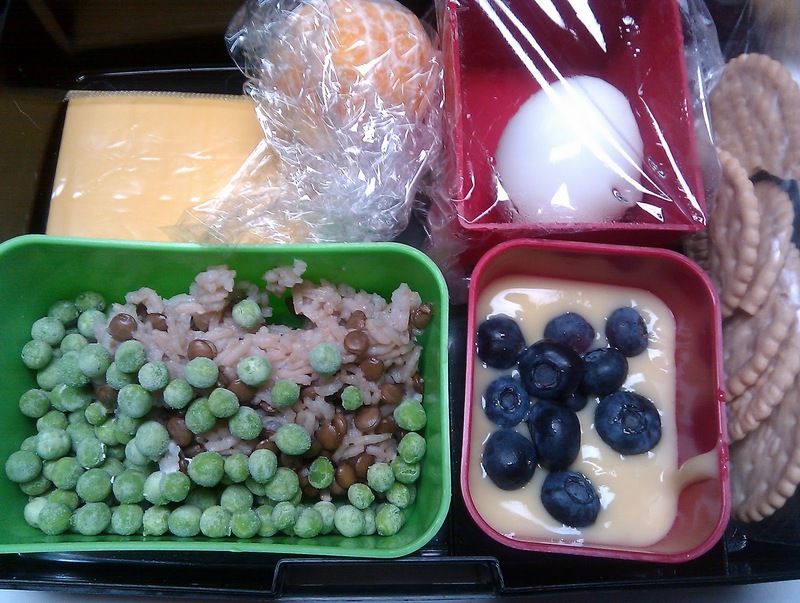 I loved leftovers in my school lunch when I was younger. It was like having a proper meal! Yum! I love that your son asks if it is gluten free. It is so important for kids with allergies (or serious intolerances) to advocate for themselves. In one way you don't want him to know he is different, but in another, you do want him to be aware of these things. Imagine if you had known which foods made you sick way back when? 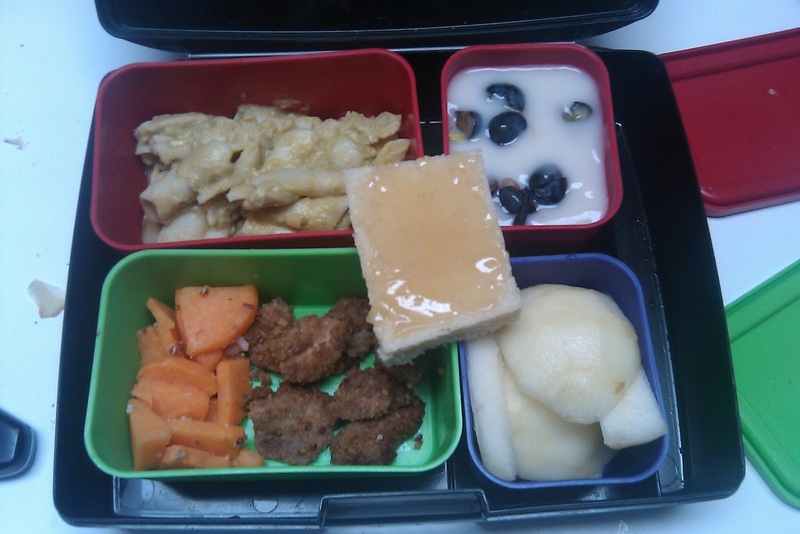 Some days his lunches looked similar to your son's: diced cooked potatoes and broccoli, leftover chicken I'd cooked the night before, peeled sliced fruit, diluted juice or milk, maybe some rice pasta in tomato sauce. 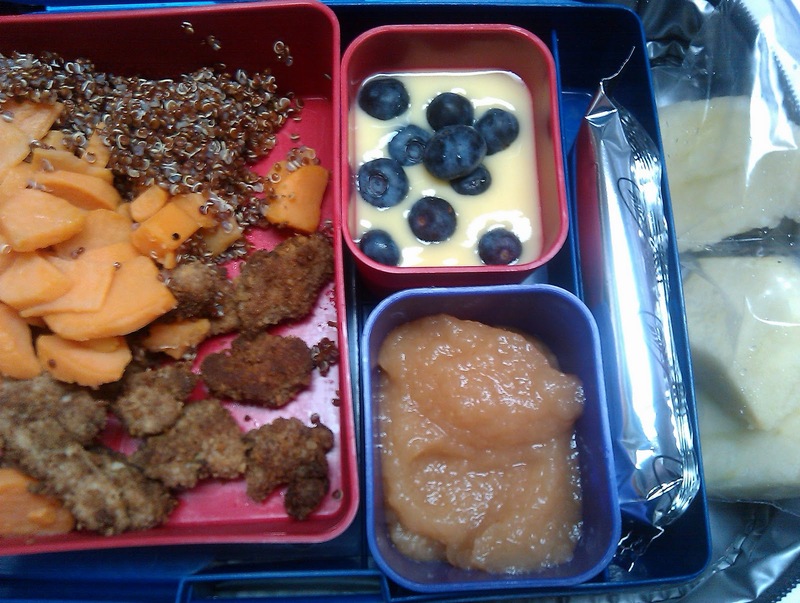 Other (lazy) days, they were more like home-assembled lunchables: rice crackers and deli meat, supplemented with some grape tomatoes, yogurt, and a snack of fresh fruit. 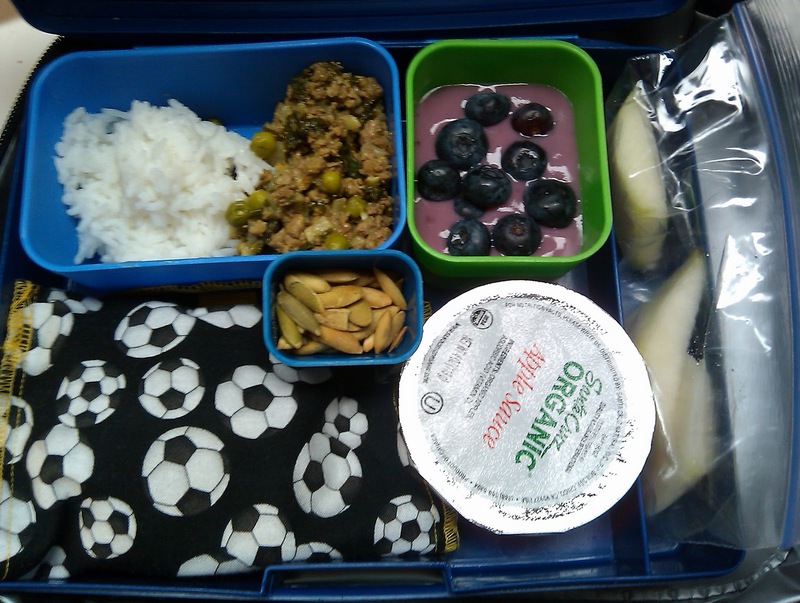 On average, I think he was pretty nutritionally balanced, and now that he's older, he prefers a packed lunch to the cafeteria food. I think his cafeteria does a pretty good job nutritionally (whole grain everything, unlimited servings of fruit and veg, baked not fried) but the appeal factor needs some work. For example, fruit he gets from home is way better (ripe mango, organic berries, pomegranate) than the hard crunchy pears and mealy apples they have in bulk at the caf. And the waterlogged veggies in the hot food line aren't winning over the broccoli haters anytime soon. I still have issues with things like the quality of meats used in the meals (it's that ammoniated beef and industrial poultry that can't walk around or reproduce unassisted), the lack of entree variety (definitely an over-reliance on nuggets, and it's the same 5-7 entrees looped over and over again) and how freely they like to dispense the chocolate milk.